Spencerville’s Joel Lotz returns to Bearcats at running back after a season where he rushed for 805 yards and 13 touchdowns in 12 games. PLAYER TO WATCH: Joel Lotz, a 5-8, 160-pound junior running back, rushed for 805 yards and 13 touchdowns (12 games) last season. Aug. 24 LCC 7 p.m.
Aug. 31 at Parkway 7:30 p.m.
Sept. 7 Perry 7 p.m.
Sept. 14 Allen East 7 p.m.
Sept. 21 at Ada 7 p.m.
Oct. 5 Columbus Grove 7 p.m.
Oct. 12 at Bluffton 7 p.m.
Oct. 19 at Paulding 7 p.m.
Oct. 26 at Delphos Jefferson 7 p.m.
SPENCERVILLE – Sometimes it takes a while before a team will come together with a new coach. When Chris Sommers took over the Spencerville football program last season – after a successful stint at Delphos Jefferson – it didn’t take long before his squad got adjusted. After losing its first two games of the season, Spencerville then won nine of its next 10 games, en route to winning the Northwest Conference title and playing in the state playoffs – where it lost in the second round to Marion Local. Sommers said his team did not rest on its laurels after last season’s success. Sommers said the transition went pretty well. The Bearcats return 11 letter winners. However, Sommers did not enter summer camp with the depth chart set in stone. At quarterback, there are two battling for the starting job. In 2017, Lee did not get many opportunities to throw the football in the Wing-T. On the season, Lee was 15-of-32 passing for 269 yards, two touchdowns and two interceptions. 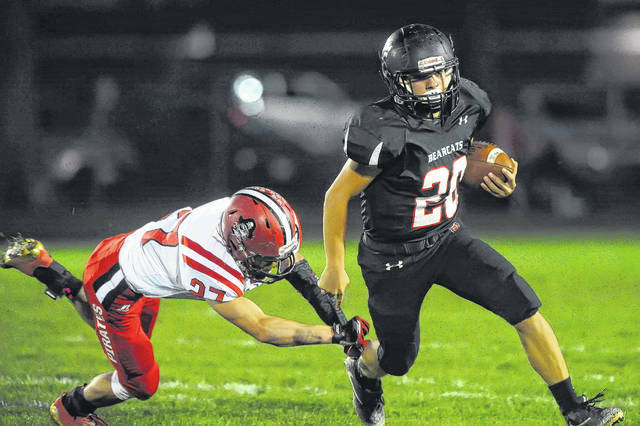 Spencerville’s biggest loss from last season, is the graduation of running back Chris Picker, who rushed for 1,421 yards in 10 regular-season games. Returning in the backfield for the Bearcats is junior running back Joel Lotz (5-8, 160). In 2017, Lotz rushed for 805 yards and 13 touchdowns in 12 games. Along with Lotz is senior running back Cannan Johnson (5-8, 150). Last season, Johnson rushed for 670 yards and 12 TDs in 12 games. “I think our team is a lot closer this year,” Johnson said. “We’ve become more of a family. Last season, the Bearcats’ Wing-T offense reeled off 3,964 rushing yards (12 games). Senior wide receiver Conner Holmes (6-5, 165) said he has grown accustomed to his role, playing on a Wing-T offense. “You have to love blocking. It’s something you grow to love since you play midget football,” he said with a grin. Defensively, the Bearcats look to be solid once again. Leading the way for Spencerville’s defensive unit is senior defensive back Drew Armstead (5-7, 140). Last season, Armstead earned first team all-NWC honors, as well as earning honorable mention all-Ohio accolades. https://www.limaohio.com/wp-content/uploads/sites/54/2018/08/web1_Spencerville-vs-Bluffton-RP-001.jpgSpencerville’s Joel Lotz returns to Bearcats at running back after a season where he rushed for 805 yards and 13 touchdowns in 12 games. This entry was tagged High school football preview 2018, Spencerville. Bookmark the permalink.